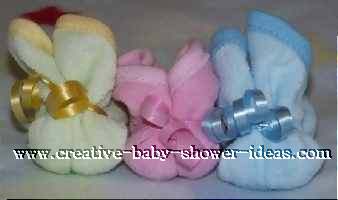 A washcloth bunny rabbit can add a touch of fun to your baby shower. Use it as a decoration or give it as a practical gift that your guests can take apart and use around the house. It is so easy to make, you will be "hopping" to try it again and again! Lay a washcloth wrong side up on a flat surface in front of you. 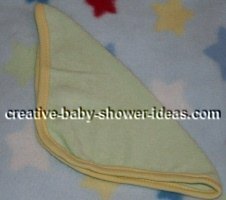 Fold the washcloth in half to form a triangle. 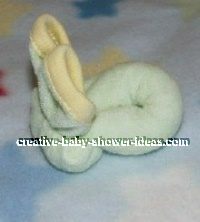 Roll the washcloth into a jellyroll starting from the small point and ending on the long side. 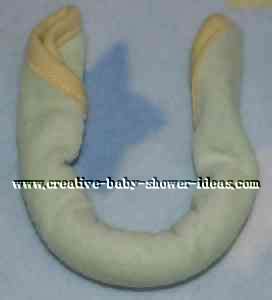 Bend the rolled washcloth in half with pointed ends facing away from you. With one hand, hold the washcloth together at a point that is about 1 or 2 inches down from the pointed ends. With your other hand, place the rubber band around the section you are holding, which will push the pointed ends back and up. This is how it will look after you put the clear rubber band around the front of the bunny. The pointed ends will become your "bunny ears". Adjust them if necessary to make sure they are even with each other. Glue or tape wiggle eyes and the pom-pom (nose) onto the face of the bunny rabbit. I have also seen the colored ends of needles use for the eyes and nose of washcloth bunnies. If you do use needles, make sure you warn the mommy so no one is hurt when they take the bunnies apart. Use ribbon to cover your rubber band and dress up your washcloth bunny. If it is curling ribbon, it will double act as a decorative touch. Here are some finished washcloth bunnies, before adding any wiggly eyes or pom-poms. Make your washcloth bunnies even sweeter! You can use the back part of the bunny to hold a variety of sweet items such as Hershey kisses, mini nail polishes, lip-gloss, or other items that match your theme. Adding small touches such as tulle and lace can really dress up your bunny when using as a decoration or giving as a gift. Give a personal touch to it by adding a cute poem or thank you note and attaching it to the ribbon. Any kind of washcloths will do for this craft. 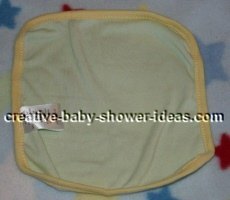 Baby washcloths with cute edging, like the pictures above, add to the whole baby look. If you are using double sided sticky tape, double check the threads of the washcloth to make sure it does not pull them out when removed. The baby washcloths handle the tape better than traditional washcloths.